Welcome to the official Facebook Page of Western New York Instructional Coaching. Get exclusive content and interact with Western New York Instructional Coaching right from Facebook. Join Facebook to create your own Page or to start connecting with friends. My father-in-law was telling a story this morning about getting an assembly line machinist job in an engine manufacturing company when he was 16, in England. In order to get the job, he had to answer several questions, including one about how many engines his team of 10 could make in an hour if 2 of the guys were new, and 8 were the fastest in the company. He guessed, and said they could do 10 an hour. The supervisor said that number was a little high, taking into consideration that even the fastest guys in the company were limited to the speed of the new guys. In order to ensure quality, the speed of the line would be decreased until everyone’s collective expertise moved the line faster. My father-in-law continued to talk about how, over the course of the following few weeks, they would check on him periodically to see how he was. The guys on his team would offer tips and tricks to make his practice better, and after a brief period, he was working at a great rate, holding his own with the experienced workers. How often do we REALLY support each other to ensure quality for all? How often do we share our tips and tricks at a level that brings everyone to a collective expertise? How often do we facilitate that level of support in our students, enabling them to help and guide each other? As someone who is in schools often working with teachers, I thought that this story underscored the importance of positivity, collegiality, and generosity. To tell someone that we will “move at the speed of YOU” is huge. It’s a relationship and trust building practice that helps to sustain the work we do for the long haul. It benefits everybody, most importantly, our students. In meetings recently with several local school districts, I've been discussing sustainability models for professional development and empowering the teachers to become leaders in their own right. I've talked about how creating and maintaining leadership from within helps with district initiative buy in by giving teachers a voice that they may not have had before, and creates a systemic basis for change with ripple effects that last for years. Positive ripple effects lead to tidal waves of change. So how exactly does a district begin the process of building that internal capacity? I've created a list of seven steps that districts could consider when they seek to encourage leadership in their staff and promote sustainability around professional development and district initiatives. Jumping on the latest bandwagon or deciding on professional development because the school down the street did it is hardly a way to decide a direction. Depending on trends or gaps in data or responding to new research that seems to have strong pedagogical value are better reasons for deciding on something new. Needs Assessments are also a good way to determine what districts should consider bringing in, asking the teachers what they would identify as a priority needs area. These assessments could be done in a group as a discussion, or a formal survey to start or end a school year. This is not necessarily about identifying who your natural leaders are, but also who stands to benefit most from a collaborative relationship. Pairing your leaders with your most likely candidates for implementing a new practice creates a large pool of action for developing the next level of impact around an initiative. Your trainers train the next wave of trainers--create a sustainable cycle of action, with many go to people as you work through bringing the entire staff on board. You could simply identify a need and discuss ways to improve it, but I like the analysis of positivity rather than just a focus on what hasn't or might not work. Specifically, I like the "Success Analysis Protocol" (S.A.P.) outlined in Lois Brown Easton's book Protocols for Professional Learning. In a nutshell, S.A.P. is about sharing the best of what teachers do, specifically as it relates to a new initiative. (And specifically gleaned from what your first round of trainers have experienced first hand.) Everyone gets a chance to share their positive experiences, ask specific questions about WHY something worked, then come to a common consensus around what those successes have in common, so that they can be replicated. From that common consensus, teachers develop a plan for implementing strategies to affect classroom instruction around need areas based on components that pointed to success for others. That plan may be a lesson plan, the integration of a new strategy, the introduction of technology, planning for ongoing collaborative meetings, etc. Then teachers try it out! They take what they've learned, what they've synthesized and created, and just do it! Then the cycle begins again. Trainers and teachers come back together, using the Success Analysis Protocol as a reflection tool to talk about what worked. They again determine what their successes have in common and seek to integrate those commonalities into their everyday instruction, creating sustainable change as EVERYONE understands how the professional development or district initiative is going to impact them personally. Note that this is a different model than "drive by" professional development, where trainers are in and out without continued support. This is more of a coaching event where successes are celebrated, and reflective practice is highly valued as an integral component of implementation. This is the easy part. As teachers become more comfortable with changes in their practice based on their professional development, they begin to see value in what they know and are able to do with their students. This growth becomes the catalyst for change for their colleagues as others are brought on board to experience the positive impact that the professional development opportunity is providing. It's not something that is meant to happen in a few days, but rather months, even years perhaps. Slow change is sustainable change. Slow change is systemic change. Slow change is valued change. Within these steps are evidence of each of Angela Maier's Classroom Habitudes: Imagination, Curiosity, Self-Awareness, Perseverance, Adaptability, and especially Courage. Each of these can easily be professional habitudes. Building capacity from within also takes being honest, being willing to have hard conversations, identifying roadblocks and overcoming them, actively listening to all stakeholders, and believing in the change districts want to see. It's not about just the "doing." It's about the learning. Several weeks ago, someone on Twitter asked the question that students should be asking their teachers all the time: "What do I have to LEARN in order to improve, versus what do I have to DO?" If professional development is just about a series of tasks, how in the world can someone really and truly make that work? It's true for students AND teachers. But, if teachers (like students) can identify what they need to LEARN in order to move forward, how valuable will that ultimately be, and what kind of impact will that ultimately make on student learning and achievement? 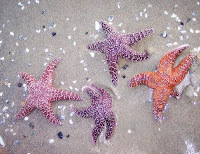 "Dancing with the Starfish. on Flickr - Photo Sharing!" Welcome to Flickr - Photo Sharing. 23 Aug. 2009. http://www.flickr.com/photos/hollyclark/412543317/>. Easton, Lois. Protocols for Professional Learning. 1st. ASCD, 2009. Print. Maiers, Angela. Classroom Habitudes. 1st. Angela Maier's Educational Services, Inc, 2008. Print. Tomlinson, Carol Ann and Susan Demirsky Allan. Leadership for Differentiating Schools and Classrooms. ASCD, 2000. Back To School BOOT CAMP! If you're not back in school already, many of you soon will be! I'm heading into a local district tomorrow to start working with Intern teachers around instructional technology. As part of my day, I want to provide some resources available online around Back To School activities. I found quite a few resources and am sharing them through a tagged results page in Delicious. JUST CLICK HERE to access! Here's hoping you have a fantastic "Back To School" and a wonderful 2009-2010 school year! Adaptability is perhaps the most important Habitude to have when considering how attitudes and habits are related to quality professional development. When a district is looking to lead systemic improvement and build effective instructional programs with strong student performance, there's a lot to be said for rising to meet challenges head on with the tools and resources that are sitting right in one's own backyard. Sometimes the greatest ideas are right there in front of you, but sometimes we tend to overthink or try to work too far beyond what is familiar. My 9th grade Social Studies teacher always said something to our class about not being able to see the forest for the trees. Sometimes the obvious is not nearly as apparent as it should be. Creatively solving problems is one of the basic tenets of adaptability. However, in the troubling economic times we live in, looking "IN" the box is sometimes more cost effective than "OUT" of the box. In nature, it's not always the strongest that survive, it's the ones that can change. 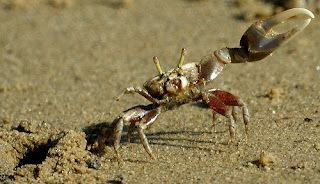 It's the ones that face new environments and situations head on, and adapt to new surroundings quickly and efficiently. We expect students to do this. This week, I was teaching a 3 day workshop on Digital Storytelling. I've had my plan in place for months and was really excited about presenting this version of the workshop, as I'd have plenty of time to not only show some cool tech tools, but also keep the content and thinking at the forefront and have plenty of creation time. During Day One, one of the participants mentioned that her daughter was one of the top Gloggers on Glogster.com. We started talking about what the Digital Storytelling process could really become and that the products could be varied, differentiated, and multi-faceted. She volunteered her daughter to come in and show us her Glogs on day two of the workshop. On Day Two, the woman's daughter came in for I what I thought would be a five or ten minute overview of her usage of this web tool. It turned into almost an hour of not only how she used it, but how motivated she would be to use this tool in the classroom. She eloquently articulated a sound pedagogical stance that sounded as though she'd been teaching for years. And this kid was sixteen years old. SIXTEEN! Her description of the way she used Glogster was EXACTLY what I was trying to reiterate about process driven tasks and keeping the content as king, not being swayed by the flashy tech tool. What I'm shooting for in PD is ENHANCEMENT, not REPLACEMENT. This teenager was able to discuss what she wrote in terms of comprehension strategies like determining importance, nonlinguistic representation, summarizing, and even collaboration. And she was doing this on her own for her own purposes. Imagine the power that would have in a classroom. This kid stayed with her mother for the course of the day and ended up helping other teachers work with some of the tech tools. I was again reminded that relinquishing a little control and being adaptable and flexible to new situations can bring a whole new realm of productivity. It also showed me that the expertise I needed in this context didn't need to extend into the outer realms of my learning network--it was virtually in front of my face. This situation allowed me to learn as much as I taught--and showed the whole room the value of how learning together is so much more meaningful than "sage on the stage." I'm relaying this so that you understand that I'm practicing what I'm preaching. Though, for many of you, I suspect I'm preaching to the choir. Adaptability, flexibility, and a willingness to act on the teachable moment are all components of effective teaching. Continuing the previous conversation about Habits and Attitudes around Professional Development, based on Angela Maier's book, Habitudes, I thought that "Courage" was also very important. When I visit teachers' classrooms, I'm always looking for innovation. I want to see practices that work and dynamic teaching that has a great impact on students and their learning. In turn, I share those practices with other teachers in workshops or when I work with teachers when curriculum mapping, in curriculum design, or in individualized coaching sessions. I'm never on a "gotcha" mission. I'm always looking for ways to improve upon what we already do as instructors--whether our students are kids or adults. I don't want to ever give the impression that I'm looking for what is wrong--because I'm not. But, I do have to say that I've worked with teachers that feel that I am "spying" or "trying to catch them doing something ineffective" far more often than I would like. This distrust could stem from past ineffective support, to union issues, or the feeling that what they do has worked for years, and who am I to sweep in and offer suggestions for improvement? What it boils down to, basically, is comfort. Some teacher's are comfortable only within a narrow zone, and other's are comfortable in a wide variety of scenarios and situations. What does it take to break out of that comfort zone? 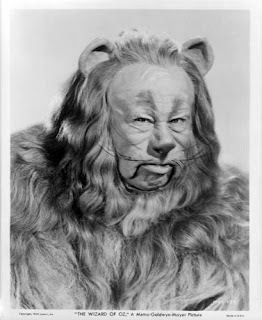 That word always brings up an image of the Cowardly Lion from the Wizard of Oz, and I think it's a great metaphor. What kind of lions are lying dormant in our schools? Now, I'm not saying that those with a narrow comfort zone are cowards, by any means, but I am saying that breaking out of that mold takes just one small moment of risk-taking behaviors that a teacher might not have otherwise tried. So, as far as professional development is concerned, this could happen in two ways. First, by identifying the strengths that a particular teacher or staff might have, you develop the risk taking behaviors in individuals by lifting them up when they do something well. Then, secondly, you develop the risk-taking behaviors by having that person develop professional development for the district to motivate other teachers to take the same risks. The benefit is sustainability, trust, expansion of comfort zones, and ultimately, impact on students' learning. Sometimes a little discomfort, a little disruption, and a little cliff-jumping has a huge impact. Nothing reframes our capabilities better than discovering that we CAN do something that we didn't think we could.